TV celebrity chefs and other famous cooks have provided recipes for various upmarket versions of this old favourite, originally imported from New York, with which to amaze and delight guests at dinner parties but the old traditional British seaside treat has a recipe which goes something like the one given below. Try it one day and you evoke the smells and tastes of 1960s swinging Britain when the Beatles were oh, so fab, and Thunderbirds were Go! As well as FAB! Oh you’ll need a tall sundae glass and a long-handled spoon. 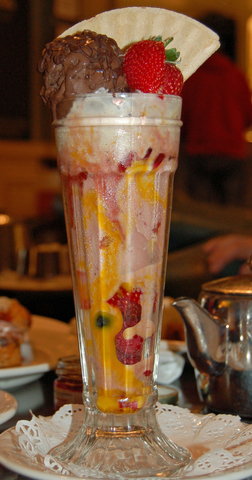 Put a layer of jelly in the bottom of a tall sundae glass Add a layer of drained fruit salad Add a layer of ice cream Add another layer of jelly Another layer of fruit salad Another layer of ice cream Top with the whipped cream, add a squirt of raspberry sauce, sprinkle with hundreds and thousands and top with the halved glace cherries.